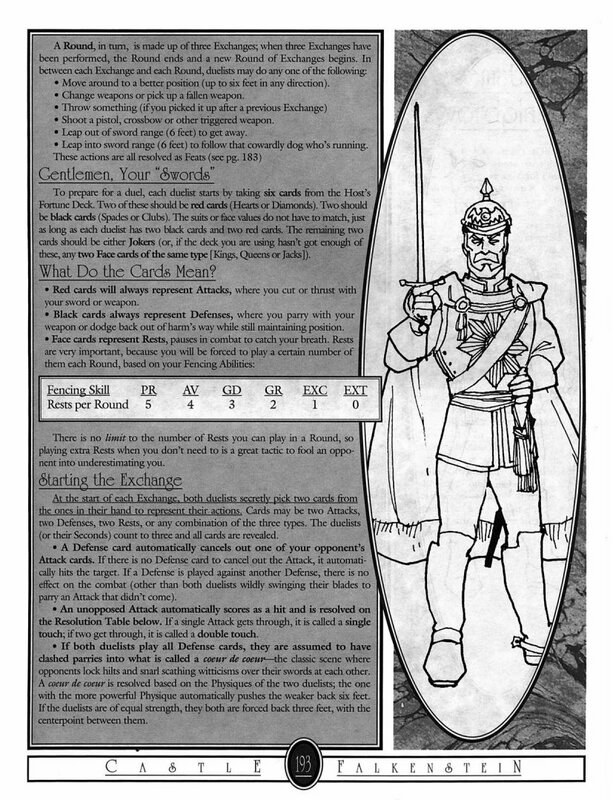 Duel rules are optional and it’s entirely possible to play “Fate of Falkenstein” without ever using them. However, here are two options in case you want the added drama, pomp, and circumstance. Stress is physical for Fencing or Fisticuffs duels, and mental for Sorcery duels, etc. This option is based on the “Swashbuckling Duels” extra described in the Fate System Toolkit, pp. 168-169, and require players to rely on skills other than Fencing (or Fisticuffs, etc.) in a conflict, with colourful results. These one-on-one duelling rules introduce something called the upper hand. Only the duellist with the upper hand can actually use a skill with the attack action to inflict harm. The other duellist can take any other action, but cannot attack—until they get the upper hand, of course. How does one get the upper hand? 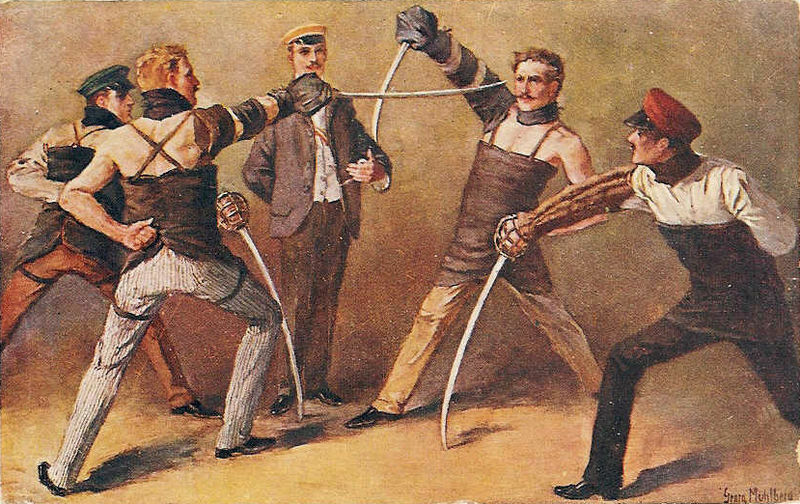 By succeeding with style with a skill other than the one that deals harm in duel-style physical conflicts (e.g., Fencing, Fisticuffs, or Marksmanship duels.) 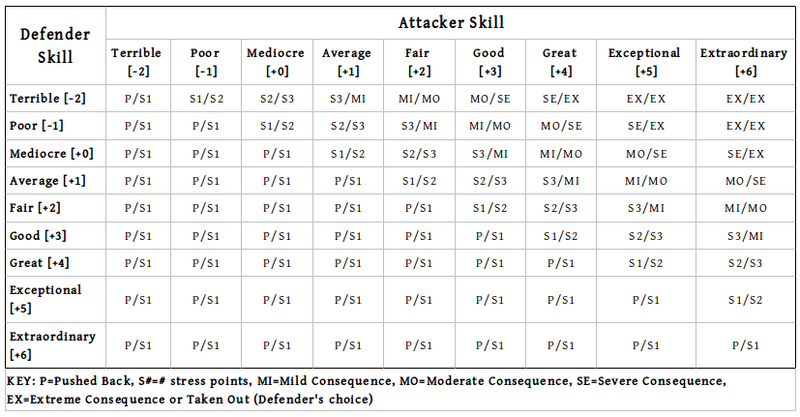 As soon as one combatant succeeds with style with one of these other skills, they get the upper hand. This replaces the action’s usual reward for succeeding with style, such as getting a boost or an extra free invocation. You get either the upper hand or the usual reward, but not both. Use a token of some kind to represent the upper hand. Whatever it is, it should be something that can easily be handed back and forth, like a coin, a little plastic cocktail sword, an index card with a hand drawn on it, a fencing glove—whatever works for your group. At the beginning of a physical conflict between two (and only two) participants, determine the turn order, as usual. 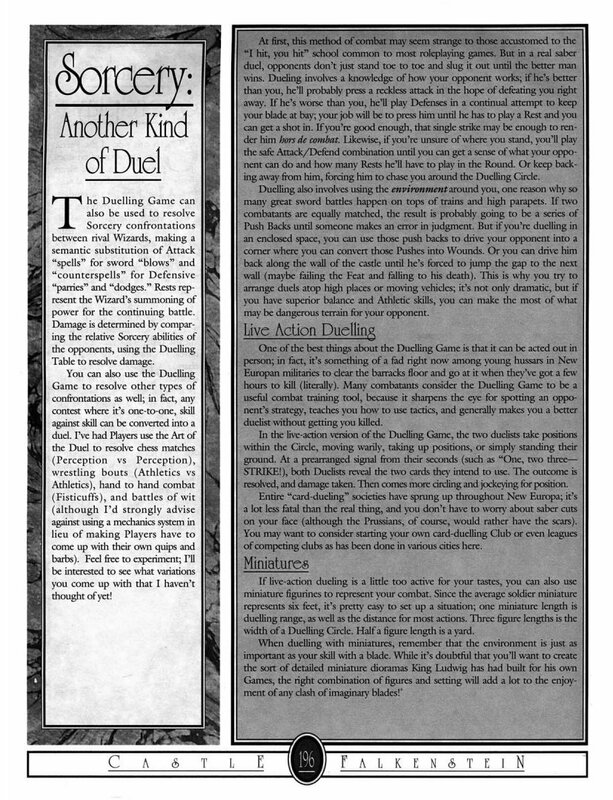 If this involves a skill test—and it probably should, duels are pretty dramatic—and one of the two succeeds with style, they start the conflict with the upper hand—they got the jump on the opponent. Do something else—put down situation aspects, try to escape the conflict, etc. This option works well in with the use of weapon aspects or when the opponents have already taken some stress; otherwise, it can stretch on for too long. Other Skills: These duelling rules can be used for mental conflicts using Sorcery or Social Graces; or for vehicle conflicts such as Motoring duels using automobiles, Helmsmanship duels using aircrafts, etc. Vehicles’ stress tracks take the damage in vehicle duels. 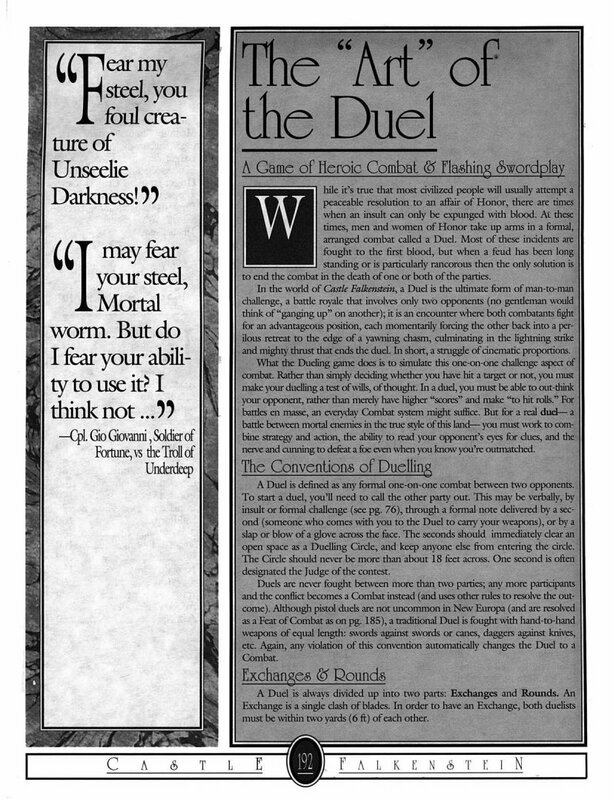 Arranging Formal Duels: In formal duels when one party demands satisfaction from an offender, each party names a trusted representative (a “second”) who will between them , determine a suitable “field of honour”. Naturally, player characters’ seconds should be some of the other PCs. It is also the duty of the seconds to check that the weapons are equal and that the duel was fair, and to agree on the conditions under which the duel will conclude. Conditions can include single shot (when using pistols), first blood (first minor consequence), until one is incapacitated (conceding), to the death, or anything the opponents’ seconds will work out among themselves and the duellists will agree to. It’s Ludwig II’s Coronation Ball and Countess Marianne Thérésa de Désirée is facing off with her old enemy, Count von Erich. The Count was a supporter of the Regent and is taking the coronation—and Marianne’s part in helping the King secure his crown—rather poorly. He insults her honour and Marianne is quite capable of defending it herself. He scoffs that she is unarmed and wearing a ballgown when she demands reparation, while he is in full uniform; but Marianne turns to her friend Tom Olam and borrows his sword. Drawing the blade with a flourish, she gives von Erich a mock curtsey. He answers with a toothy grin and draws his own sabre, as the guests clear the space around the duellists. It’s time for deeds to replace words. Skills: Excellent [+5] Fencing, Marksmanship; Great [+4] Charisma, Fisticuffs; Good [+3] Courage, Perception, Physique, Social Graces; Average [+1] Athletics, Stealth. Skills: Excellent [+5] Marksmanship; Great [+4] Athletics, Fencing, Fisticuffs, Physique; Good [+3] Perception, Charisma; Average [+1] Courage, Social Graces, Stealth. It’s a dramatic combat if there ever was one, so they each draw a card from the Deck of Fate to determine turn order. Both have Good [+3] Perception; Marianne draws +1 for a total of +4, and von Erich gets +2 for a total of +5, a normal success. No one has the upper hand yet. Turn 1: Von Erich decides to manoeuvre to back Marianne in a cornerusing his Great [+4] Athletics, and draws a +0 for a total of +4. Marianne draws a +4 for a total of +5, deftly avoiding the trap. But she dislikes the way the clutter of the ballroom and her swishing dress restrict her mobility; she decides to create an advantage by improving the situation—she raises her borrowed sword and hacks off the hem of her gorgeous House of Worth gown with one fluid slice! She’s using her Excellent [+5] Fencing against a Good [+3] difficulty—it’s tricky to do in one swing—and draws a -1 for a total of +1, a normal success; she create Now I Can Move Around! and will have one free invocation. Turn 2: Von Erich decides a little psychological advantage wouldn’t hurt; he will try to create an advantage by displaying his superior Physique. He takes a step towards Marianne, his eyes fixed on her; without even a side glance, he slices a chair in half with a blow of his heavy sabre, letting the sound of the impact do the talking. His Great [+4] Physique and a draw of -2 versus a Mediocre [+0] difficulty give him a simple success, but he really wants that upper hand before Marianne seizes it so he throws in a fate point and Dashing Hussar to generate a +2 for a success with style. The chair makes a satisfying crack! as it turns to splinter, underlying the brutal strength behind the blow. Von Erich creates the aspect Much Bigger Than You with one free invocation, and chooses to gain the upper hand instead of taking the extra free invocation. Marianne jumps back and narrows her eyes; this will not do. She hops onto a table, ostensibly to get to a better fighting position, but really to display her shapely legs; she wants to create an advantage using her Great [+4] Charisma. She draws a -1, while von Erich defends with his Average [+1] Social Graces and a +1, so Marianne gets another simple success and generates Damn, Those Are Fine Legs with one free invocation, but does not gain the upper hand. Turn 3: Von Erich attacks! He delivres a blow of his Sabre using his Great [+5] Fencing and draws a +3; in ungentlemanly fashion, he chooses to add his free invocation of Much Bigger Than You for a total of +10. Ouch! Marianne chooses to use Full Defense (see Fate Core, p. 159), foregoing her action to get a +2 to defense. She has Excellent [+5] Fencing, +2 for the full defense, and draws… a -4. She uses a fate point to draw again, getting -1, still bad—a total of +6. She adds her free invocation of Now I Can Move Around! and uses a fate point to invoke von Erich’s own Much Bigger Than You aspect as she rolls off the table and under it where von Erich will have a slightly harder time reaching her. That makes the attack a tie; von Erich is left with a boost against Marianne, On the Defensive. Turn 4: Von Erich presses his advantage while he still has the upper hand, attacking again with a +0 and his boost for a total of +6. Marianne decides to risk a normal defense, draws a +1 for a total of +6. That’s a tie, which will give von Erich another boost on her, Poor Footing. Marianne really wants to turn the tables, so to speak, so she pops up on the far side of the tableand reaches over with the point of her sword to slice off a string of crystals from the chandelier right above von Erich’s head. Excellent [+5] Fencing and a +1 card over a difficulty of Average [+1] give her that coveted success with style! She creates the advantage Tangled in the Chandelier on von Erich with one free invocation, and foregoes the second free invocation to gain the upper hand. Turn 4: Von Erich must regain the upper hand! He uses his Great [+4] Athletics to vault over the table and corner Marianne, drawing a -1 versus a difficulty of +1. He generates the aspect Closing In with one free invocation, but no upper hand. Marianne, instead of moving away, decides to risk everything: she moves to close in as well! She draws a +2, adds her free invocation of Tangled in the Chandelier, and for a fate point invokes her aspect Bag of Tricks, for a total of +11. Von Erich defends with Great [+4] Fencing, draws a +1, add his free invocation of Poor Footing and Closing In, and for a fate point invokes Much Bigger Than You to generate a tie. Marianne gets a boost on von Erich, Touché. Turn 5: Since they are so close, von Erich wants to use his Great [+4] Physique to create an advantage by pushing Marianne off balance, with a draw of -1; but with her Excellent [+5] Fencing and a -1, she uses her footwork to step away. Marianne strikes for the heart with Excellent [+5] Fencing, a +2 card, and the Touché boost for +9. Von Erich defends with Great [+4] Fencing, and realises that he can’t possibly draw well enough to counter this; even with a good draw of +1 or +2, he’s facing a success with style from Marianne. 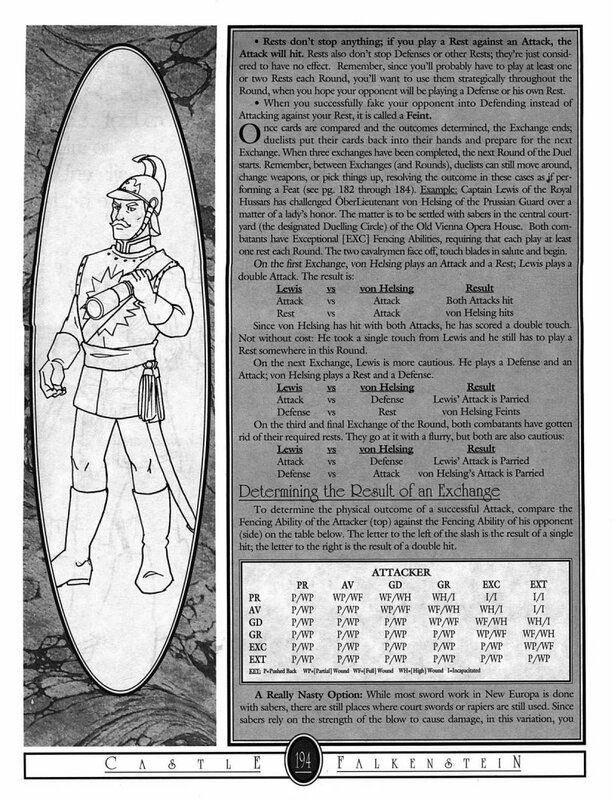 Von Erich would then have a choice: he might be able to spend his last fate point to invoke Dashing Hussar and reduce the attack to a normal success, but Marianne could still spend a fate point to offer a severe consequence thanks to the harm rank of D on her heavy sword, and he would have no fate point left to refuse with. Or he could take the blow, in which case on a success with style Marianne can spend a fate point to force him to be taken out or take an extreme consequence. One of von Erich’s aspects is It’s Not Worth My Life; he decides to remember this and concede the fight rather than draw a card. He drops his sabre with a snarl of impotent rage, and Marianne stays her hand at the last possible instant. 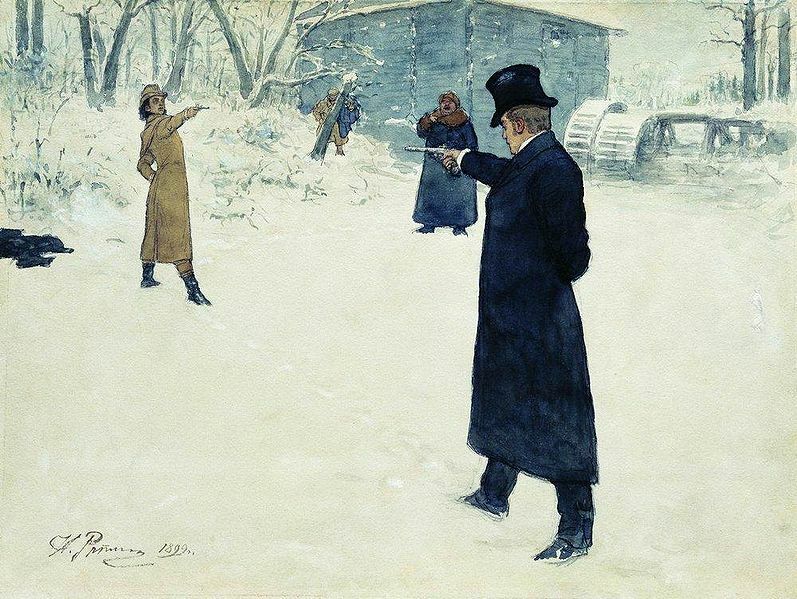 Images: A fictional pistol duel in the 1820s between Eugene Onegin and Vladimir Lensky, painting by Ilya Yefimovich Repin (1844-1930); German students of a Burschenschaft fighting a sabre duel, around 1900, painting by Georg Mühlberg (1863–1925). Public domain, obtained from Wikipedia. 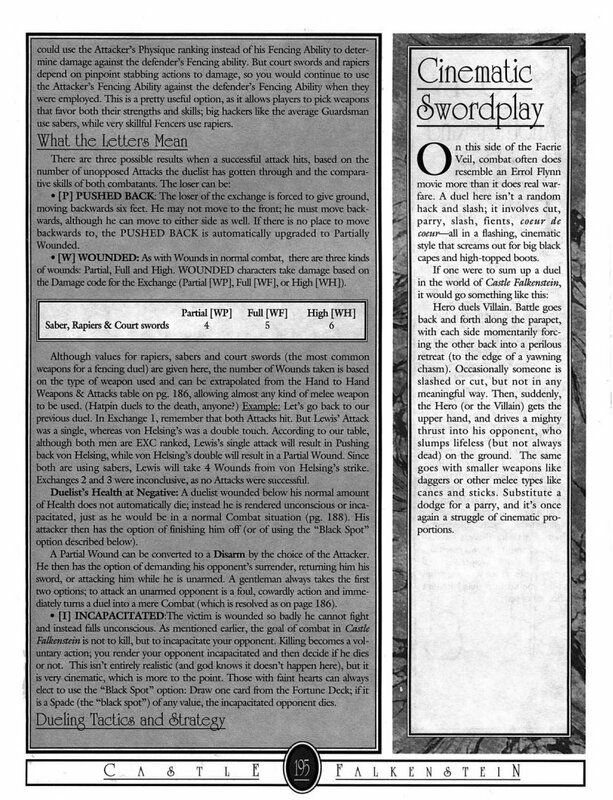 Posted on December 30, 2013 January 1, 2014 by mechanteanemonePosted in fiction, games, rpgsTagged Castle Falkenstein, Evil Hat Productions, fantasy, FATE, Fate Core, games, R. Talsorian, rpgs, steampunk. Interesting. Though I have always taken a Pliskinesque approach to dueling.